Be the first to share your favorite memory, photo or story of Tessie. This memorial page is dedicated for family, friends and future generations to celebrate the life of their loved one. 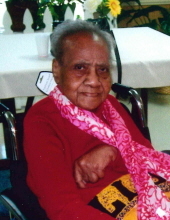 Mrs. Tessie Lee Martin Parks, age 98 passed away Friday, January 25, 2019 at Westwood Hills Nursing and Rehab. Funeral services will be held 2:00 PM Thursday, January 31, 2019 at Mt. Valley Missionary Baptist Church with Rev. Casey Walker, Rev. Fred Thomas, and Rev. William Brown officiating. Burial will be in the church cemetery. The family will receive friends from 6:00 until 8:00 PM Wednesday evening at Reins-Sturdivant Funeral Home. Mrs. Parks was born April 15, 1920 in Wilkes County to Jim and Clara Belle Parks Martin. She loved singing and cooking and was a good displinarian for the children. She loved to attend church, was a good wife and mother. She was a member of Mt. Valley Missionary Baptist Church. In addition to her parents, she was preceded in death by her husband; Walter Lee Parks, two granddaughters; Barbara Ann Sales and Nicole Mallard, eight sisters; Flouranna Walker, Alta Wilborn, Toylee Gentry, Lou Finna Hawkins, Lula Belle Hague, Laura McBride, Mary Dobbins, and Hardy Patterson and four brothers; John Willie Martin, Albert Martin, Ernest Martin and John Martin. She is survived by; four daughters; Penelope P. Sales of Walkertown, Callie S. Parks of Jonesville and two adopted daughters; Stephanie P. Brown of Mt. Holly and Elaine P. Martin and husband Lawrence of Roaring River, five grandchildren; Janet P. Martin, Vernon Lee Sales and wife Velvet, Kim Sales, Elcheva P. Waters and husband Ian and Alisa Sheriff and husband Abraham, thirteen great grandchildren; Brooke Martin, Zach Martin, M.J. Mayberry, LeMya Smith and husband Shelby, Lee Sales, Temeka Penn, Justin Waters, Jason Sales, Megan Green, Sasha Howell, Damian Craig, Sasha White and Krystina Waters, ten great great grandchildren; Ava Howell, Gianna Craig, Clara Bell Mercer Waters, Cedrick Sutton, Jr., Ariyanna Craig, Jaleah Gambill, Alianna Craig, Breyson Byers, Haze Oliver and Kyla Fritz. To send flowers or a remembrance gift to the family of Tessie Martin Parks, please visit our Tribute Store. "Email Address" would like to share the life celebration of Tessie Martin Parks. Click on the "link" to go to share a favorite memory or leave a condolence message for the family.